Looking to add a payment processor to your ThriveCart account? In this article we walk you through the steps of integrating with a payment processor. Note that with ThriveCart you can connect multiple accounts for each processor. We don’t limit you to a single account or processor. This gives you the freedom to set up different products in your account to be processed by different business accounts in your processor. The first thing we need to do is head over to your settings area in the dashboard menu. From the settings area, we need to view our integrations by clicking this button. 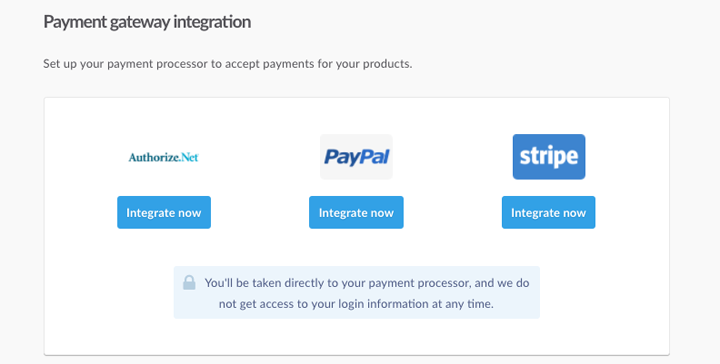 Under our integrations we have the option for payment gateways. We want to click view settings to be taken to our options. We’ll then be taken to the page where we can choose which payment processor we want to integrate with. At the time of writing, we currently integrate with Authorize.net, PayPal, and Stripe. Clicking one of these options will provide you with the details on integrating or adding/removing new and existing accounts for these processors.